November 29th is International Women Human Rights Defenders Day. Grey and Bruce counties have long histories of women standing up for the rights of their communities and of women. 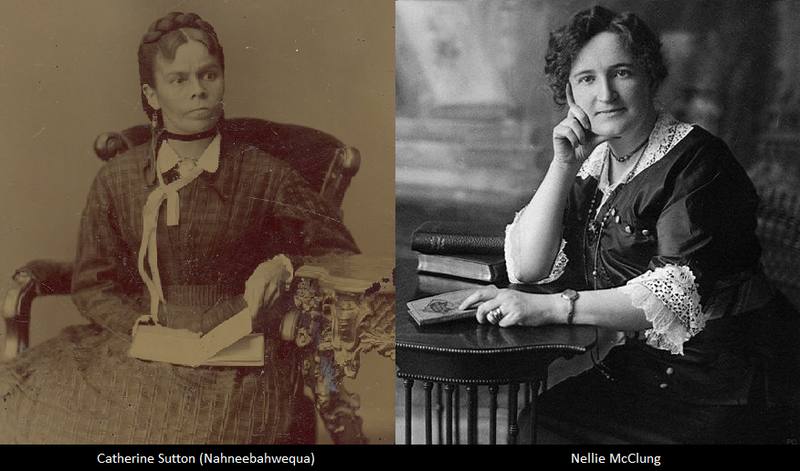 Today we’ll look at the stories of Catherine Sutton (Nahneebahwequa) and Nellie McLung. Catherine Sutton (Nahneebahwequa) was born in 1824 in the Credit River flats. When the Credit Mission – where she lived and taught – was denied title in 1846, Catherine and her family accepted an invitation from the Nawash Ojibway community to move to the Saugeen Peninsula. At that time, Treaty 45 ½ between the Saugeen Ojibway and British representatives protected Saugeen and Nawash territories north of highway 21 as well as indigenous fishing rights for all time.The Nawash community gave the Suttons 200 acres in what became Sarawak township. Catherine and her husband — a Methodist Minister — cleared the land, built a house and barn, and began to farm. The Suttons lived on that farm until 1852 when they accepted a mission placement in Saulte St. Marie and later in Michigan. In the years since Treaty 45 ½ was signed, British settlers had become increasingly dissatisfied with the territorial boundaries and began to occupy First Nation lands. In 1854, Laurence Oliphant, Superintendent General for Indian Affairs, pressured the Nawash and Saugeen communities to sign Treaty 72, surrendering most of the Saugeen Peninsula and creating the reservations at present day Saugeen and Neyaashiinigmiing (Cape Croker). When the Suttons returned to their homestead in 1857, the British denied their claimed to the farm. Colonial officials also denied Catherine Indian status – depriving her of any financial reparations from the treaty – because she had married a settler man. These injustices spurred Catherine on to a campaign advocating for the rights of indigenous peoples, for the return of her family’s land, and against the fickle colonial policies legislating indigenous identity. An impressive writer and speaker, Catherine gained support from organizations across North America and raised sufficient funds to travel to England in 1860 and personally petitioned Queen Victoria that indigenous peoples should be able to own land and practice their customs freely. As a result of Catherine’s advocacy, the Suttons were allowed to buy back their farm but many indigenous families saw no justice. Catherine spent the rest of her life supporting indigenous legal and political rights and documenting their struggles against government injustice. She died in 1864 at 41 years old. At the time when Catherine Sutton was advocating for her people, her voice and the voices of women, indigenous peoples, and people of colour were specifically ignored by the Canadian political system. They could neither vote nor hold office. Nellie McLung set out to change that. Born in Chatsworth in 1874, her family moved to Manitoba in 1880. She became a writer, political organizer and fierce champion for women’s right to vote. Angry at the disenfranchisement of women and persistent legal stance that they were not ‘persons’, she worked with other women to change Canadian law. They wrote articles and published pamphlets, lobbied government, and staged rallies across the country. The social movement they created was so strong that the Canadian government eventually extended the right to vote and hold public office to women — although it should be noted that only white women were enfranchised at the time — and subsequently confirmed women as ‘persons’, making it possible for them to join the senate. Nellie herself held office in Manitoba and Alberta and her work cleared the way for other women, like our own Agnes Macphail, to enter politics at various levels. Catherine Sutton and Nellie McLung are only two of the many women from our part of the world who have advocated for and defended women’s rights and human rights against powerful forces that sought to deny them. As we celebrate Women Rights Defenders Day in 2018, let’s support the powerful women who are advocating in and for our community today. If you know of a local woman currently defending rights, write to Violence Prevention Grey Bruce and tell us about her work.